From a book ‘Environmental and climate analysis for the Norwegian agriculture and food sector and assessment of actions’ by John Hille, Christian Solli, Karen Refsgaard, Helge Berglann, Knut Krokann published on ResearchGate. Download the full book on ResearchGate. 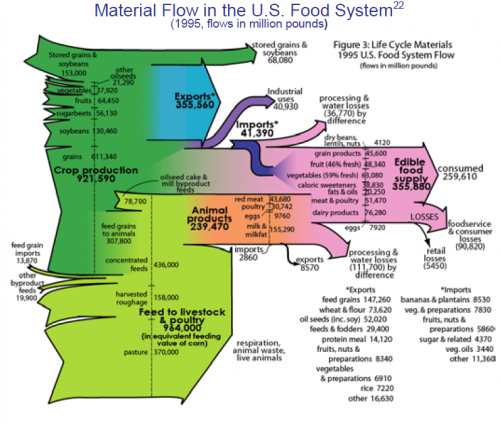 This is very similar to Jason Pearson’s Economy Maps for visualizing environmental impacts. Blog reader Johannes send me a note and suggested to feature the below diagram. Thanks for that. Tony Hirst from OUseful.info created it after seeing a map-based diagram for horse meat trade flows on the Guardian Data Blog. Tony used Mike Bostock’s D3s Sankey Plugin that allows creating this type of diagrams directly from data in Excel/CSV files. 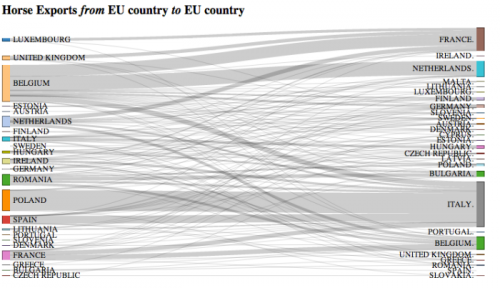 In his post he describes how he proceeded to build this Intra EU Horse Meat Trade diagram. Somewhat techie, but nevertheless makes an interesting read. Overall trade quantity was more than 60.000 tonnes in 2012. 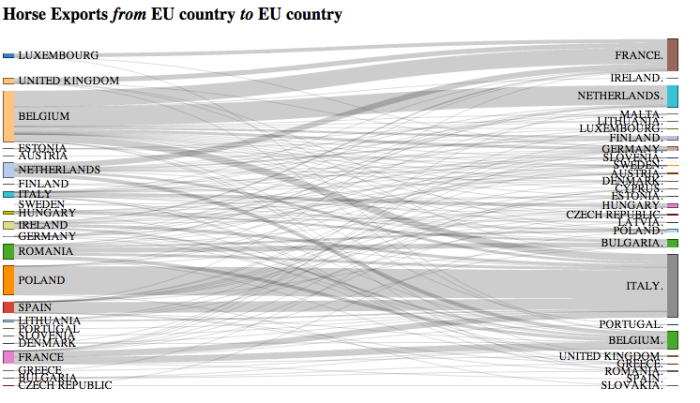 Largest exporters are Belgium and Poland (left side), largest importers are Italy and France (right side). Data is from Eurostats. The above is a only a static picture, but you can go here to play around with the interactive version. Data labels and quantities are available in the interactive version when you hover ths mouse over certain bands. You can also move the nodes up and down vertically and group the countries differently. 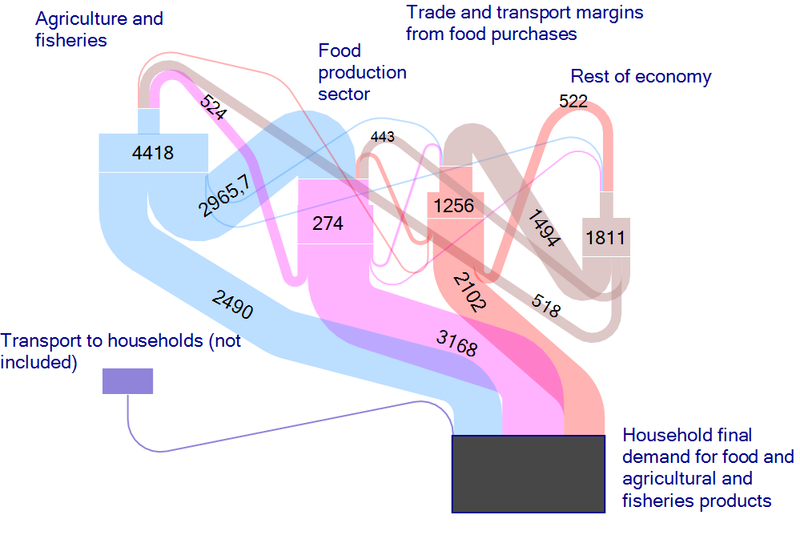 This special type of Sankey diagram is also refered to as distribution diagram and (…hate to say it in light of the current scandal) a Spaghetti diagram. Fineo and Parsets (see software list) can also be used for this type of diagrams where statistical data is grouped into categories (here: exporting and importing countries) and bands/streams/spaghettis are shown between the categories to represent the relationships between them. Here is my May 2012 post on distribution diagrams with d3.js. After all these Sankey diagrams for energy flows, flows of carbon, phosphorus, and the like here is a special one for all those of you, who are coffee addicts – like me. 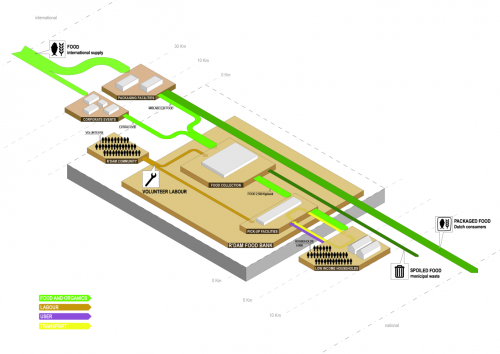 Saman Zomorodi on his blog ‘Saman’s System, Sites and Buildings’ features a coffee flow Sankey diagram in this post. 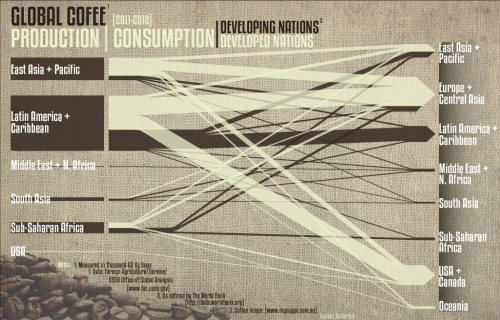 This is an infographic for global coffee production. Producers are on the left side, coffee consumers are on the right. 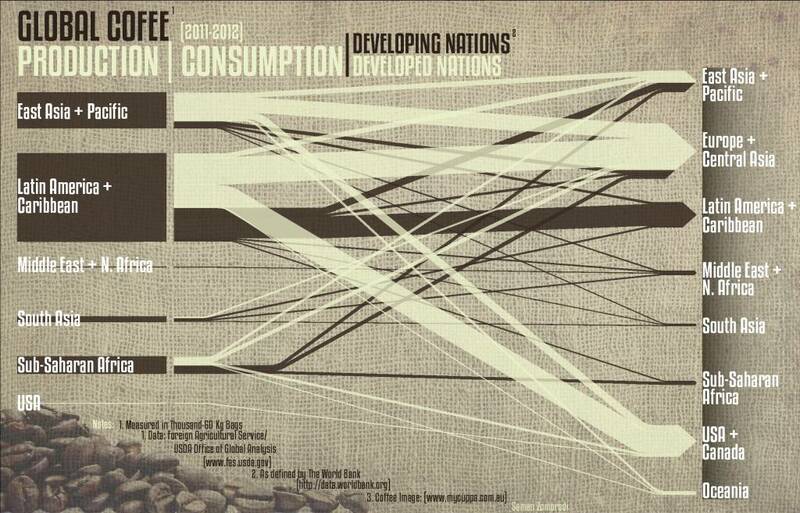 The dark brown flows are for developing nations, while the milk coffee color ones are for developed nations. No quantities given in the diagram, so we don’t learn the actual absolute figures. The original image is >2MB and I had to resize it with a loss in quality. 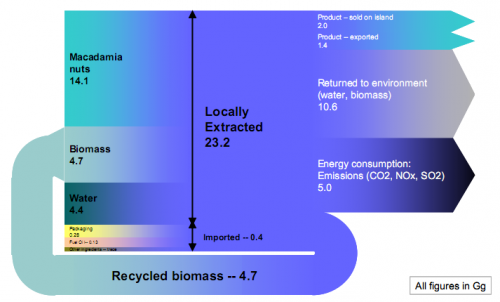 Visit Saman’s blog to download a highres version of the diagram. The report about the Material Flows on the Big Island of Hawai’Ii I blogged about a while ago has another Sankey diagram which is interesting and I thought I share this one too. The diagram shows the input/output flows of material in the Mauna Loa macadamia nut processing plant. Annual production is 3.4 tons. All flows are in Gg (that’s 10E9 grams, or 1000 tons). Apparently a tiny problem with the recycled biomass loop flows, but otherwise a nice one. Small and trace flows not to scale for good.